You are here:Home-LS Fest Bowling Green-Click To Find Out How To Win a Torqstorm Supercharger in Three Pedals Rumble Index! Click To Find Out How To Win a Torqstorm Supercharger in Three Pedals Rumble Index! What could be better than free boost? During this year’s Holley LS Fest, the 9th annual Bowling Green, KY, event (7-9 Sept), TorqStorm will give away a supercharger kit to a participant in the Three Pedals Rumble Index Class. The participant with the best bracket racing package in the first round of competition claims the reward. The best bracket racing package refers to the driver’s reaction time and deviation from dial-in. Cut a mean light? Your car runs consistent numbers to the hundredth? Is it LS powered? Come to Bowling Green and win far more than the purse payout check. 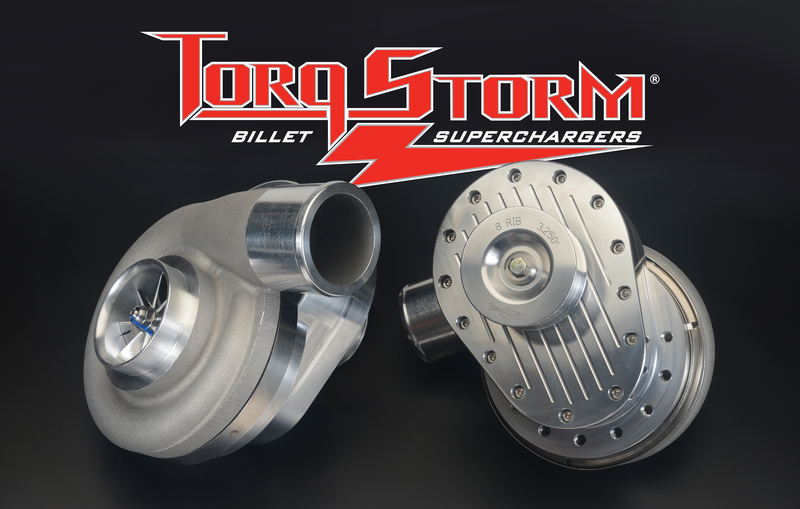 TorqStorm will present a centrifugal supercharger kit valued at $2,800 or, if desired, receive a $2,800 credit toward a more expensive system. Currently, TorqStorm produces both single and twin supercharger assemblies for over 50 engine configurations. Options range from basic kits to those with full accessory drives. Twin kits support 1,000-plus horsepower while the single can make 750 plus. Both can be adapted for use with electronic fuel injection or carburetion. Californian Brenda Cox, winner of the TorqStorm supercharger kit in Holley’s LS Fest West, held in Las Vegas earlier this year, has plans to compete in the upcoming Bowling Green event. Her dominating Vegas performance secured her the title, the trophy, first-place cash as well as a new TorqStorm centrifugal supercharger of her choosing. TorqStorm billet superchargers is the offshoot of an established tool and die firm located near Grand Rapids, Michigan. At its core is a band of astute and longtime gear-heads who have blazed a trail for high quality, affordable superchargers with a winning limited lifetime warranty.